Located close to the Institut de France and the River Seine, this square has some unusual features including stone benches shaped like open books plus a water fountain now classed as an historical monument. You will be able to discover the unique and unusual Square Gabriel Pierne located close to the River Seine and many other famous tourist attractions, in an area known as the Saint-Germain-des-Pres, which is renowned for its bookshops and art galleries, many of which are close by. 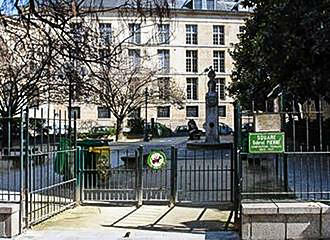 Now this square in Paris was named after the French musician and composer Gabriel Pierne who died in 1937, and was first inaugurated in 1938 according to the plaque you can discover on the railings by the entrance gate. 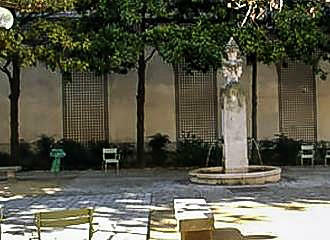 And within this square, you will be able to discover one of the many fountains in Paris that was first sculpted back in 1830 by Alexandre Evariste Fragonard in order to supply water to the Carmelite market, however when this market was destroyed, the fountain was saved and moved to the Square Gabriel Pierne. You will see that the fountain has a small basin with a central stone monument, which has two faces positioned on the top opposite each other, and these are also the two sides where the water spouts are located. Plus these faces, sometimes known as allegories, were designed to represent abundance and trade, and this old fountain has been registered as one of the historical monuments in Paris since the 1950s. But there is also a bronze statue located within the Square Gabriel Pierne, which was designed and produced by the Italian sculptor Marcello Tommasi in 1968, and is of a young girl, that was named Carolina, which you can see inscribed on the pedestal base of this statue. However, another unusual feature of this square in Paris, is the fact that there is no grass areas, yet there are plenty of stone benches, which are often utilised for people sitting and reading. 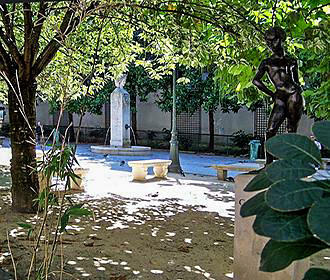 Plus there are also two stone park benches that have been designed as open books, which is quite apt for the area and another unusual feature of the Square Gabriel Pierne that is located right near a very historical library called the Bibliotheque Mazarine. Located in the 6th Arrondissement close to the Institut de France and the River Seine, you will find a plaque from the Mairie de Paris on the railings next to the gate into this square in Paris that states it is open from 8am during the week and 9am at weekends. However the closing times do vary from 5pm during the winter months and work their way upwards through to the late opening times of 8.30pm from 1st May until 31st August. But we would like to point out that no dogs are allowed, and the area is only partially accessible to the disabled and there are no places to play ball games, which are also prohibited, yet there are plenty of stone park benches to relax on. So if you are in the area and wish to sit for a short rest, enjoy a quick lunch etc, then you will find cafes and places to purchase snacks nearby, and if this is a stop off before venturing to other tourist attractions in Paris then the nearest Metro station is the Pont Neuf stop via line 7, which is located on the opposite bank of the River Seine. Alternatively, the bus lines 24 and 27 along with the Noctilien Night Bus lines N12 and N13 will also get you close by.